Depending on the grade, have a lilycup-shaped, Chalmovidnaya, funnel-shaped, tubular or bell-flowers. 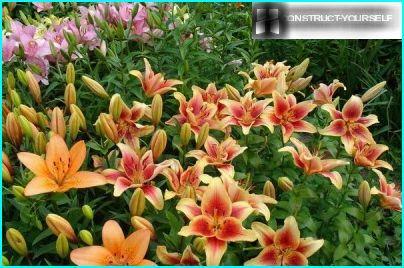 Height lilies varies from 0.5 to 2 m Low-growing varieties can be planted as a border, and the tall -. Both tapeworms and flower garden in the background. Lilies are often planted in groups: distinct islands of different varieties, or combined with other perennials and annuals. Pink lilies form a tandem with an expressiveplants with large leaves sprawling. A good background for yellow lilies create a rhododendron, euonymus, barberry, Mahonia. Beauty lilies is stronger in combination with evergreen species: juniper, cypress, thuja. 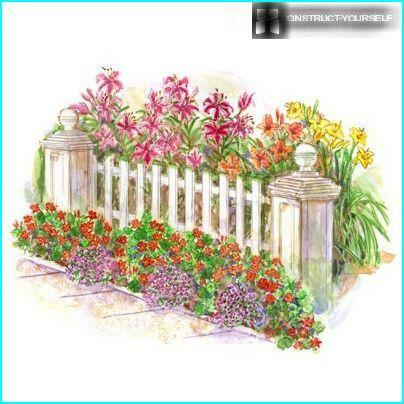 Tall lilies look great asplanting of the background and along the fence delineating the border area. In a single planting lily-win tapeworms, being placed in the middle of the lawn on the hill. 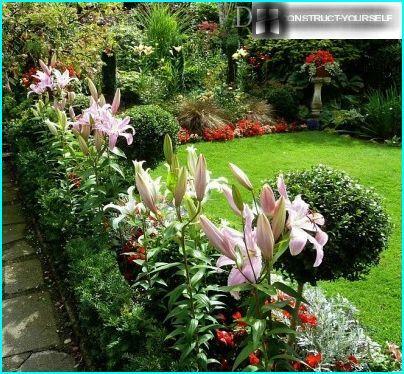 Good lilies and trees in the foreground when the thick green foliage background plays a role for the royal flower or a small group, formed of 2-3 lilies. 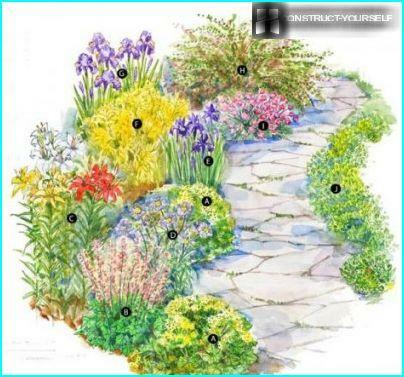 Low-growing species perfectly highlight paths and flowerbeds, and grades for mixborders chosen to admire the flowering royal colors all summer and beginning of autumn. Lily harmoniously combined with peonies anddelphiniums, ferns and junipers, Astilbe and Alyssum. Lilies are often placed clumps because of their color and compatibility with other plants in tone, as well as the shape and texture of foliage. For planting along the tracks, and the formation of low curbs perfectly lily tubular and its variety of lily Garrizi height of 70-80 cm Flowering in July, pure white buds. Good for the same purposes Formosan lilyheight 60-90 cm, with narrow tubular buds. But the most impressive outline the track, as well as complement the ridges and borders Thunberg Lily stunted in height up to 50 cm, flowering in May and June mottled orange flowers. 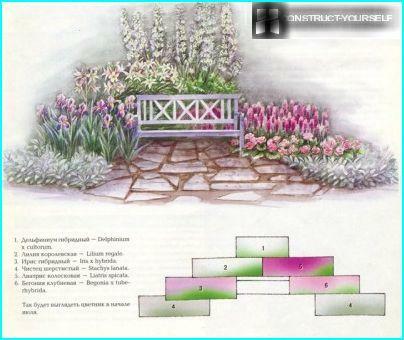 Another type that can successfully draw the lower tier beds and decorate rock gardens, - a lily drooping height of 40-60 cm, with pink and purple flowers Chalmovidnaya. Due to the expressive form of inflorescences and erect stems with showy foliage in landscape design lily often planted singly or in small groups. Golden Lily. 150 cm. White speckled, blooms in July-August. Lily regalia. 120 cm. White with purple blooms from June to July. Lily kandidum. 100 cm. White, blooms in July-August. Lily chalmovaya. 150 cm. The purple, red or yellow, blooms in June-July. In the garden, where everything is subordinated to the aestheticperception, it is important to achieve a harmonious combination of lilies with other plants. 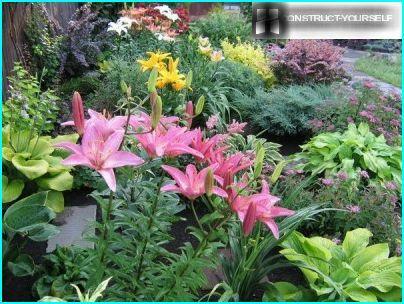 To Lily looked impressive in the garden, they need to be planted, obviously imagining how they will look in an environment of other colors, as well as trees, shrubs, and other decorative elements of landscape design. 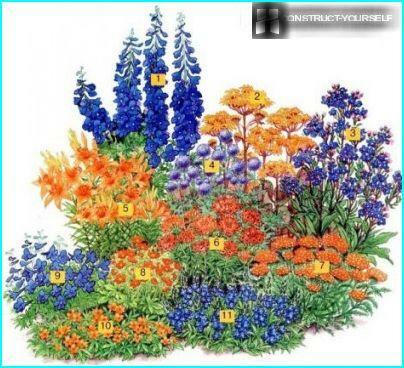 Each species has individual lilies,unique to him and decorative botanical features that should be considered when creating a landscape compositions - this is the height, size and hue of flowers, time and duration of flowering, leaving nuances. 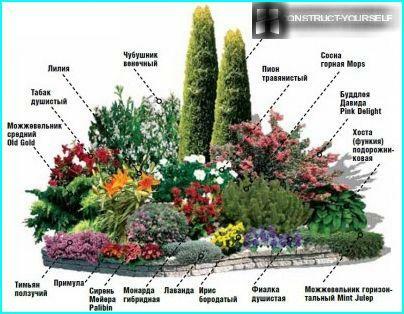 In landscape design looks successful flower garden,created from lilies of different groups or different grades of the same group planted two or three tiers. This multi-tiered array lilies looks very impressive. In the foreground lilies undersized varieties form a lush mat - their pick among "Asians" and LA hybrids, flowering earlier than other species. It is desirable that the lowermost tier of lilies blossomed first, and then began to blossom medium and high tiers of planting - they are formed from a tall Oriental lilies or OT-hybrids. When planting groups of species lilies desirabledivide the tiers of other plants. 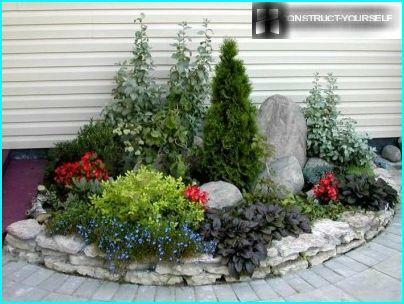 For planting in front of lilies are great low-growing conifers, gradually expands to the sides and covering the ground. 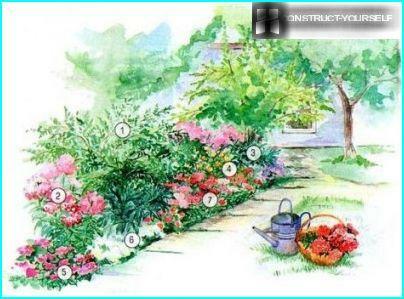 Of all garden flowers best lilycombined with peonies that bloom early roses and lush foliage have high decorative - it serves as a backdrop for the roses, no matter how planted peonies - behind or in front of lilies. It will be particularly spectacular group of peonies Beforeundersized lilies in conjunction with ground-covering phlox by alternating flowering in May, phlox, peonies in June lilies in July. Behind peonies look great high grade and Orienpet Oriental hybrids lilies that bloom in July and August. Not very well combined lilies and irises, which leaves after flowering quickly dry up and lose their decorative effect - at this moment irises do not need watering, while it is needed lilies. 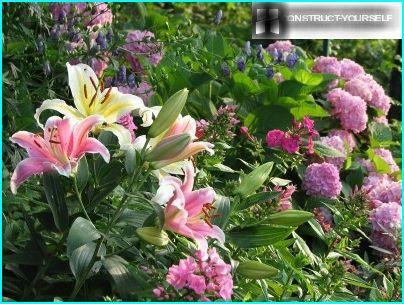 Lilies and roses is not the best fiton a bed - they are good in landscape design by themselves. 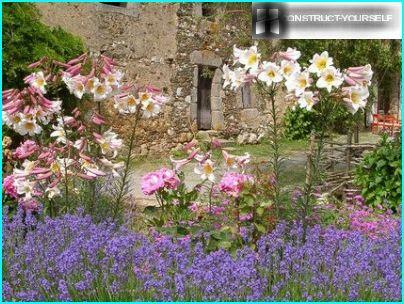 But if all the same, there is a desire to put the queen and queen of the garden together, it is desirable to place a tall lily with dark flowers light behind bushes climbing roses. Roses also look good with lilies identical color. When the rose grows in a single planting, it is alreadyIt is a bright spot of the composite, so close to the rose bush lilies are planted in small groups of 3-5 specimens, otherwise they will be lost on the background. Not all types of phlox in harmony with lilies -sharp blue and purple tones of Phlox paniculata in tandem with lilies will look too gaudy. But creeping phlox varieties of blue or pale lilac shade, blooming in the early spring, will form a good background for the younger shoots of lilies. In summer phlox shiny leathery leaves will create a kind of curb in front of roses planting, and in the winter serve as a mulch layer. In the foreground of roses is very gentle landingIberis look bushes 10-15 cm tall, blooming snow-white buds and trim all year round, preserving green foliage extending in the winter as a mulch for the lilies. Another great option for landing before the lilies - alissum gradually expanded and forming a beautiful green carpet dotted with small white flowers. The large landscaped gardens where the lawncombined with decorative bushes and trees, medium and low-growing lilies planted on lawns and along paths. Lily turf varieties for landing are chosen so that they stand out well against the background of grass due to the bright color - be it Asian lily hybrid saturated orange or red tones. For borders, you can use low speciesany color. Impressive form duo lily and coniferous evergreen shrubs such as juniper. 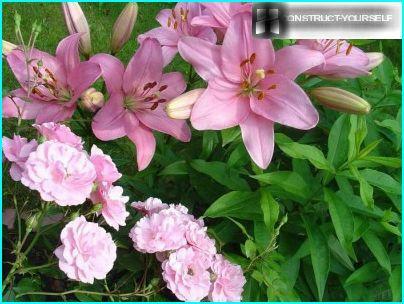 Lily and planted in front and on the sides of conifers, and if the use of high grade, and the rear bush. A. Alchemilla mollis (Alchemilla mollis) 2 pcs. B. Heuchera (Heuchera «Champagne Bubbles») 1 pc. C. Lily (Lilium) 3 pcs. D. scabious (Scabiosa «Butterfly Blue») 1 pc. E. Siberian Iris (Iris sibirica) 3 pcs. F. Japanese Spirea (Spiraea japonica «Goldmound») 1 pc. G. Iris (Iris) 3 pcs. H. Berberis thunbergii (Berberis thunbergii) 1 pc. I. Armeria maritima (Armeria maritima) 3 pcs. J. Kamchatka sedum (Sedum kamtschaticum) 9 pcs. 1. Delphinium tall dark-blue (Delphinium). 2. Ligularia dentata (Ligularia dentata). 3. Anhuza azure (Anchusa azurea) «Loddon Royalist». 4. ordinary Echinops (Echinops ritro). 5. Lily «Enchantment». 6. Phlox «Citrus» 7. Yarrow (Achillea) «Terracotta». 8. The purple avens (Ceum coccineum) «Werner Arends». 9. The short macranthon larkspur (Delphinium grandiflorum) «Blauer Zwerg». 10. Tonga cinquefoil (Potentilla tonguei). 11. Veronica broadleaf (Veronica teucrium) «Kapitaen». 1. mock orange (Philadelphus). 2 Phlox paniculata (Phlox paniculata). 3. Hybrid Peony (Paeonia x hybr.). 4. Tiger Lily (Lilium tigrinum). 5. Mexican Ageratum (Ageratum houstonianum). 6. Lobulyariya sea (Lobularia maritima). 7. Turkish Carnation (Dianthus barbatus). 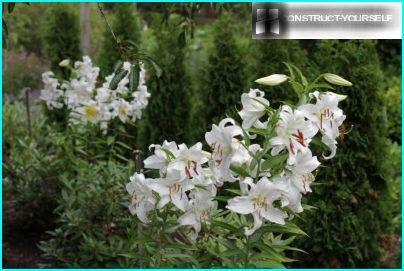 To harmoniously fit into the landscape lilydesign, you must decide whether it is a single landing or group - based on ideas, pick the appropriate grade of lilies: the optimal height, size and colors of buds. Asiatic hybrids of lilies. The height of 80-100 cm, flower diameter of about 15 cm. Blooming in June, well spend the winter in the open field, unpretentious in the care. Asian varieties have a wide range of colors, they vary in height and size of buds - the lily give scope for imagination when creating a landscape garden design. Red: Solfarino, Senseyshn Red, Black Out, Black Jack, Hiawatha, Cocktail Twins, Landini, Linda, Matrix, Olin. White: Navona, Costa, Annamarie Dream, Crossover. Yellow: Top Line, Fata Morgana, Black Spider, San Wali, Vento, Golden Stone, Grand Cru, Graffiti. Pink: Lollipop, Iowa Rose Arosa Jewell, Wali Nappa, Vermeer, Delilah, Chianti. Purple: Double Senseyshn, Night Flyer, Nettiz Pride, Purpl Ai, Purpl Life, Push Off. Orange: Apricot Pixel, Bullfighting, Loreta, Art Orange, Orange Electric, Pearl Justin. Tubular (Longiflorum) hybrids of lilies. Heat-loving flowers, wintering under goodshelter, with small buds and delicate flavor: yellow (Delia), magenta (Devine, Miyabi, Tzira), White (White Elegance, Prime Ice, Elegant Lady). This culture is mainly hothouse lilies, in the open ground it is rarely cultivated. Hybrids tubular (Longiflorum) and Asian lilies (LA-hybrids). Height strong erect stems with beautiful.. Leaves 1-1.3 m diameter velvety, upward of about 25 cm flowers are blooming in July, well winter - hardy varieties resistant to diseases. LA hybrid lilies are perfect for growing in the open field, successfully complement its multicolored landscaped garden. Red: Fangio, Red Planet, Constable, Original Love, Royal Grace, Tomar. White: Litovin, Oakland, Ice Crystal, Bright Diamond, Donatello, Ercolano. Yellow: Royal Fantasy, Frey, Buzzeto, YELLOW Kokot, ProMinent, Royal Fantasy. Pink: Cavalese, Turandot, Arbatax, Beyonce, Indian Summerset, Cavalese, Little Kiss, Moselle, Nora, Rodeo. Purple: Noranda, Sabatini, Samur, Cecil. Orange: Bestseller, Erema, Indian Diamond, Kentucky, Superpower Crossing, Orange Kokot, Fiamma. Oriental (Oriental hybrids). Powerful development of green, a large bush height 0.8-1.5 m. The diameter of the exotic flowers of about 25 cm. Bloom in August, do not hibernate (better dig out the bulbs and store in the basement). Oriental lilies - the most spectacular and popular among gardeners, but some competition in landscape design, they are beginning to make new varieties of OT hybrids, other than early flowering. Red: Distant Drum, Montezuma, Magic Star, Pico, Stargazer, Sumatra, Taygervudz. White: Innocent Lady, Rialto, Casablanca, San Glov, Triumphant, Muskadet, Annika, Double Party, Legend, Marco Polo. Yellow: Royal Fantasy, Frey, Anais Anais, Brekdans. Pink: Isabella, Bernini, Josephine, Acapulco, Bergamo, Belonika, Double Surprise. Purple: Dizzy, Power Gloss, Starfighter, Entnrteyner. Hybrids Asiatic and Oriental lilies (OA-hybrids). Diameter up aimed flowers 18-20 cm. In this new group of hybrid varieties a little: yellow (Yellow Power, Kaveri, Nanjing, Sanya Crown), pink-red (Cocopa, Red Power, Festus Crown, Crown Elegant). Hybrids Oriental lily varieties and tubular (OT hybrids or Orienpet). The height of the shrub 1.5 m. The huge fragrant buds with a diameter up to 30 cm are directed sideways and upwards. Easy to care for, winter without problems. Red: Mussasi, Ed Hart, Satisfekshn, Sophie. White: Boogie Woogie, Jura, Eastern Moon, Coco, Mr. Cass, Ovation. Yellow: Gold Class, Yellouin, Katina, Lesotho, Pontiac, Solange, Fifty Fifty. Pink: Bowmore, Beyuotch, Glyuveyn Judy Fowlis, Donato, Myth. Purple: Dalian, Judith Saffinya, Life Style, Miss Fairy. Orange: Morini, Orange, Space, Saltarello. Hybrids tubular Orleans and lilies. The most resilient varieties of lilies of all kinds, stable and fungal, and viral diseases, but in the winter require shelter. White: White Apfeysing, Lady Alice, regalia regalia Album. Yellow: Yellow Apfeysing, Golden Splendor. Orange: Orange Apfeysing, African Queen. Martagon hybrids. Smaller chalmovidnye flowers with foliage, located whorls. Durable, hardy, disease-resistant varieties. Purple: Purple Martagon, Maruun King. It is a new group of lilies LO-hybrids (Oriental plus Longiflorum) a funnel-shaped flowers: pink (Bellsong, Dolcetto, Pink Neven, Prince Promise), white (Global Beauty, illusion White Triumphant). Another new series of roses, obtained by triple crossing - LOO-hybridsHaving flowers, shades diameter of about 40 cm: White (Bright Diamond, Eagle, Nuance Polar, White Triumph), pink (Drimuiver, Pink Diamond, Pink Panther, Forlan, Faith). In domestic latitudes experienced gardeners recommend lilies grow such varieties: Regalia, Crystal Star, Merostar, Narbona, Grand Gru. 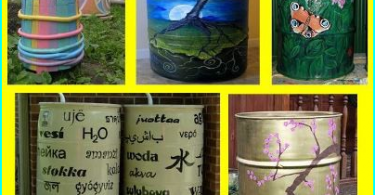 But to put in landscaping bright strokes, use rare varieties of lilies: Red (African Lady, Black Beauty, ScarletDelight), White (Gold Bend, Virdzhinele, Spetsiozum albumin), pink (Lancon, Spetsiozum Rubrum lily drooping), orange (lily of David, Lily, Henry, lily leopard), yellow (lily Canada lily dwarf lily Leyhtlina, Lily Hanson ). The emergence of new varieties and hybrids with the richesta painting palette and unique decorative properties allow lilies to win a strong position in the landscaped garden, decorating their appearance beds, curtains, borders.